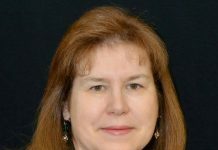 Peachtree City Foamcraft has released the names of the winning entries in their annual Monument Sign Design Contest. The design contest made its debut in 2016 and continues to grow. 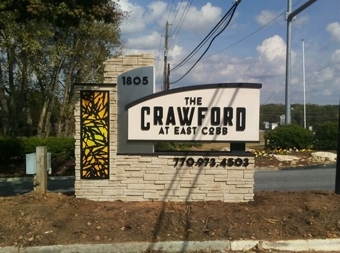 The Crawford, a custom monument sign designed by FASTSIGNS Norcross, Georgia took home the Grand Prize of $1,000.00. 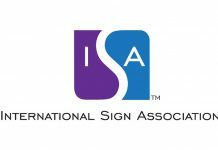 The unique design incorporated a variety of dimensional components including a unique architectural sign base design, faux stone elements, raised dimensional letters and metal. The second place cash prize of $500.00 was awarded to Southern Sign Systems. Their entry, Eastwood Baptist Church, also incorporated a variety of dimensional elements which made the structure stand out. The faux brick base held up a custom designed foamcore monument sign with raised graphics including a cross. The structure was custom manufactured to incorporate a changeable copy board and illuminated cabinet—which literally and figuratively made this entry shine. Last, but not least, Peddlars Fork, an architectural way-finding monument sign designed by Resource 4 Signs took home the 3rd place prize of $250.00. This foamcore sign boasts a custom textured background which simulates the look of redwood, white raised graphics and a hand-sculpted faux stone base. To view all contest entries, visit Peachtree City Foamcraft’s Facebook page.